This recipe was featured in How I Am Trying to Forgive Myself and Clean Out My Fridge (Sort Of) in my occasional blog Random Acts of Deliciousness. 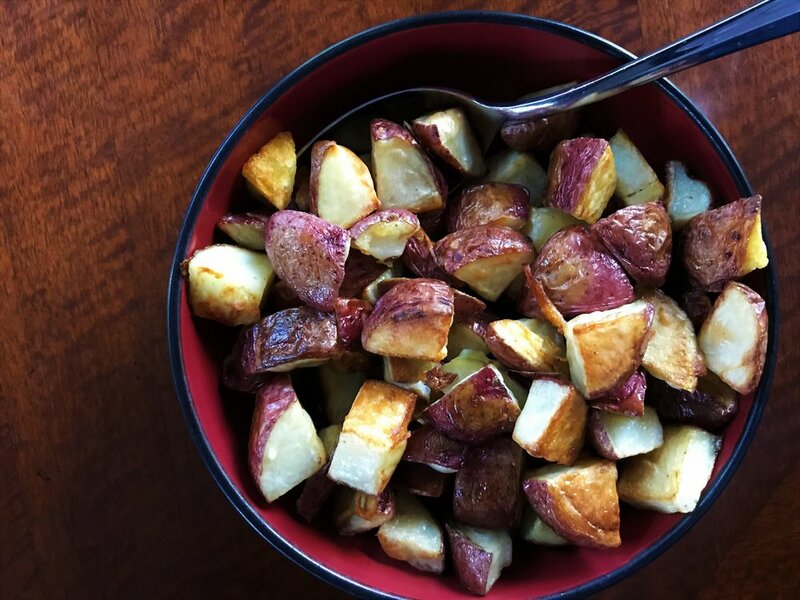 Roasted Red-Skinned Potatoes made in the Adventure Kitchen. 1. Preheat oven to 450 degrees Fahrenheit with the rack in the middle position. 2. Cut potatoes into roughly 1-inch chunks. (No need to peel them.) Toss them in a large bowl with the oil and salt, then spread them in a single layer on a large rimmed baking sheet lined with foil if necessary. 3. Bake for about 25-30 minutes, until potatoes are softened and browned in places. (The browning will happen mostly on the surface that comes in contact with the hot pan, so you might not see it until you move them around.) Remove the pan from the oven and let the potatoes rest for about 5 minutes. 4. When the potatoes have rested, they'll release themselves from the pan (or foil), making your job easier. Use a wooden spatula to scrape them free from the pan as needed. Taste and sprinkle a bit more salt on them if needed. Serve hot. 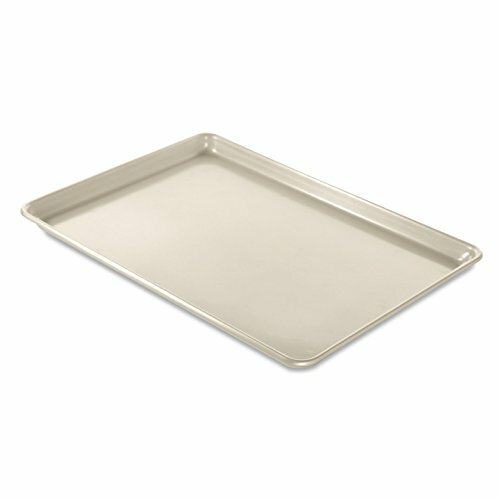 A nice nonstick baking sheet will change your life. If you've been putting off buying a new one (come on, we all know your old one is in terrible shape! ), just take the plunge already. I put it off for the longest time, and now I can't imagine why. I got two of these pans recently, and am SO glad I did! I got the "Big Sheet" size, so I can roast large quantities of things all at once. If your pans are smaller than mine, you might need to make this recipe in batches, or just cut the quantity down a bit. You can make these potatoes ahead of time, refrigerate them, then reheat them the next day. (I usually make a big batch for this very reason. I serve some that day, then have the rest for leftovers later in the week.) They should keep for at least a few days. (I would not freeze them, though.) To reheat, stick them back in the oven at 350 degrees for 15 minutes or so. You also have my permission to microwave them, but just know that the crispy-crusty parts will be less so.